Check Out Our Group Fitness Schedule Below! Our Spring Schedule begins March 1st and runs through the end of May. Core de Force® Live This MMA-inspired workout brings together exhilarating boxing, kickboxing, and Muay Thai combinations and mixes them with fat-blasting cardio and bodyweight moves to help you zero in on stubborn belly fat and carve all over definition. Cycling Cycling will burn calories, build strength, develop muscular and cardiovascular endurance and improve overall fitness in a low-impact structure. 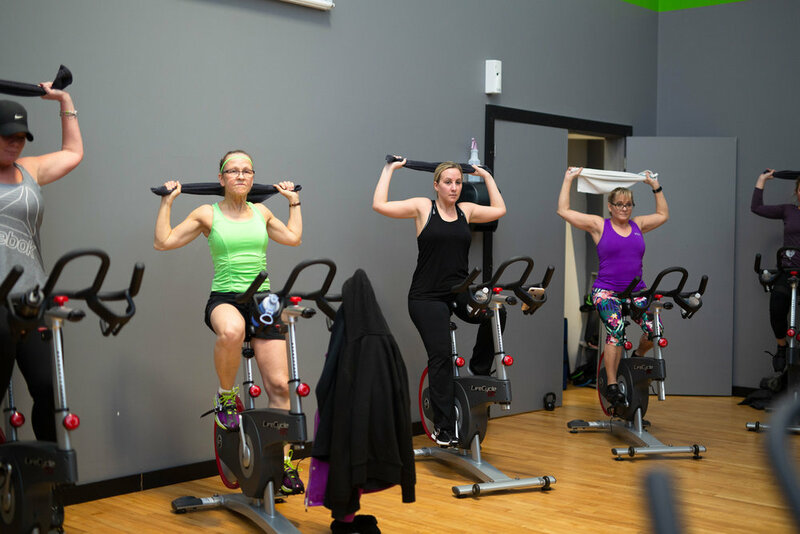 The energetic music inspires each rider through a variety of speed and resistance challenges lead by a motivating instructor. Insanity Live® Push your body to the max & reach your personal best, no matter where you’re starting from. Group-focused cardio & athletic conditioning drills without any equipment to help you burn fat like never before. Kickboxing Experience a combination of cardio, strength, boxing and martial arts drills which provide a total body workout aimed to improve strength, aerobic fitness, speed, flexibility, coordination and balance using a standing bag. ^Please remember to bring your own gloves. We have a limited number of gloves that students can borrow during class. P90X Live® Transform your body with a variety of strength training moves, cardio conditioning & core work. Build strong, lean muscle & bust through any plateaus that stand in the way of your goals. PIYO Live® Sweat, stretch & strengthen – all in one workout! Low-impact, high-intensity Pilates- and Yoga-inspired moves will work every muscle in your body, creating a long, lean & defined physique. 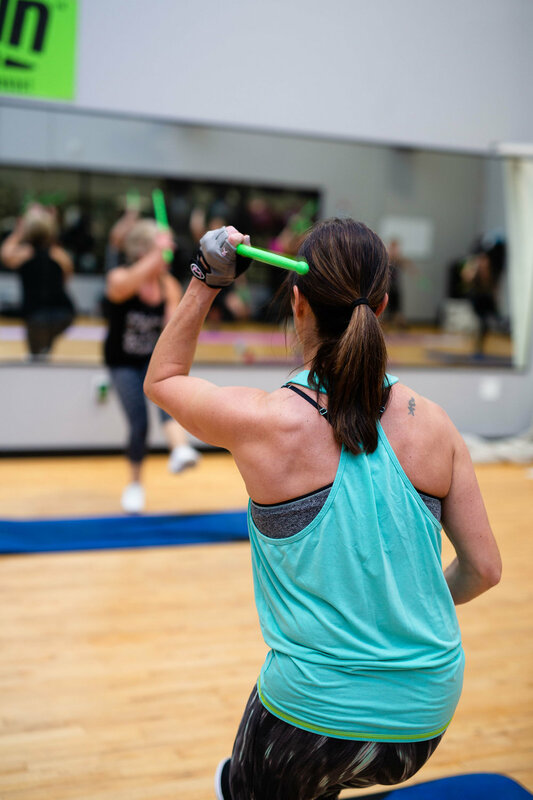 POUND® This class is a full-body cardio jam session, combining light resistance with constant simulated drumming. Strengthen and sculpt infrequently used muscles & drum your way to a leaner, slimmer physique – all while rocking out to your favorite music! Pure Strength This class will focus on defining muscles and increasing muscular endurance. You will use a variety of tools including dumbbells, kettlebells, med balls, body weight and more! This class will allow you to focus on developing muscle from head to toe. R.I.P.P.E.D. ® This class utilizes resistance and cardio training, which masterfully combines the Resistance, Intervals, Power, Plyometric and Endurance components of R.I.P.P.E.D. to help you attain and maintain your physique in ways that are fun, safe, and doable. RUMBLE® From the creative team responsible for R.I.P.P.E.D.® comes a brand-new group class that is an authentic, yet simple to master cardio mixed martial arts class. Tour de CORE This class is a 25-minute EXPRESS class focusing on everybody’s favorite area – the CORE! “Brace” yourself for a solid ab workout that can work as a quick stand-alone workout or complement any other activity or class you decide to do that day! 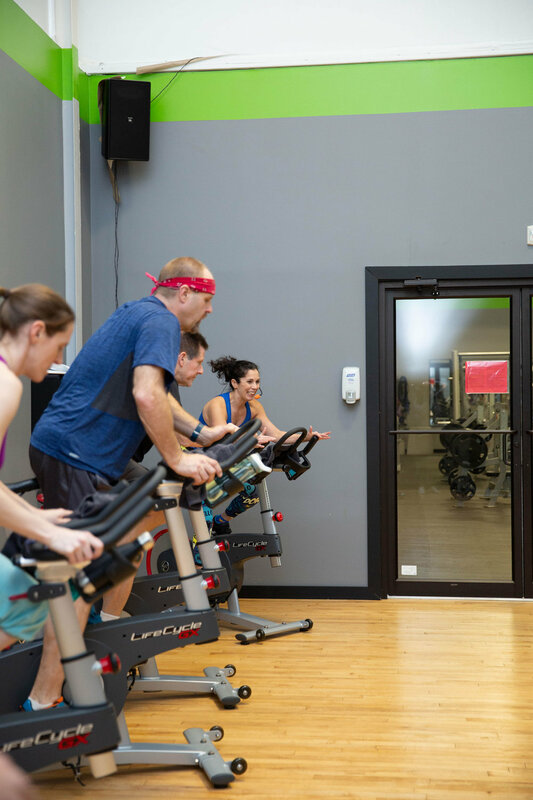 Turn & Burn A fusion class that may be in one of two formats: (1) a solid 25 minutes of cycling followed by 25 minutes of resistance training for an efficient total body burn or (2) an interval class where students will alternate cardio drills on the bike with strength drills on the floor. WERQ® is the wildly addictive cardio dance workout based on the hottest pop and hip hop music. The workout is nonstop with repetitive athletic moves and fresh dance steps so you get the best sweat. Ready to WERQ?! Yoga This class is based on Hatha yoga postures designed to improve strength, flexibility, and balance. The perfect way to balance your workout regimen while enhancing your overall well-being and health. Note: Yoga classes may contain various strength elements of Pilates to really challenge the core muscles. Zumba® Zumba is a perfect workout for everybody and Every Body. Zumba takes the “work” out of workout, by mixing low-intensity and high intensity moves for an interval-style, calorie burning dance fitness party. Thank you for allowing us to join you on your journey!